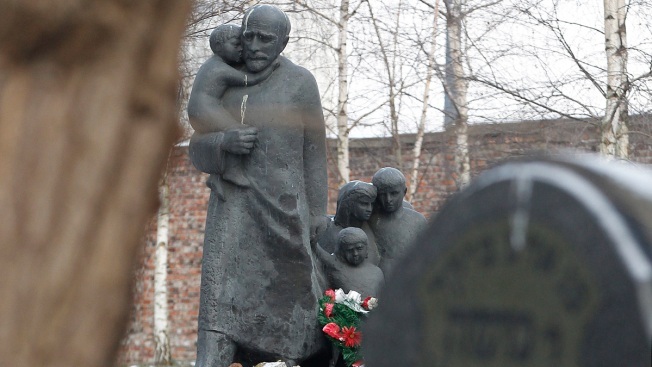 Flowers are placed at the memorial to Janusz Korczak who died in the gas chamber of the Treblinka Nazi German death camp in 1942 together with the children of the Jewish orphanage that he ran in the Warsaw Ghetto, at the Jewish cemetery in Warsaw, Poland, Thursday, March 1, 2018. A Polish law that makes it a crime to falsely accuse the Polish nation of crimes committed by Nazi Germany took effect on Thursday. A Polish law that makes it a crime to falsely accuse the Polish nation of crimes committed by Nazi Germany took effect Thursday, part of a wider effort by nationalist authorities to use history to defend the country's honor and pride. For years Polish officials have struggled to fight phrases like "Polish death camps" that are sometimes used abroad to refer to Auschwitz and other death camps that Nazi Germany built and operated on occupied Polish territory during World War II. Some Poles fear that as the war grows more distant, new generations will mistakenly believe that Poles were the perpetrators of the Holocaust. The law, however, has sparked a crisis with Israel, where Holocaust survivors and officials fear its true aim is to repress research and debate about Poles who killed Jews during the World War II. Polish and Israeli representatives met Thursday in Jerusalem to resolve a standoff over the law. "We must make sure that historical truths are preserved and that there be no restriction on the freedom of research and speech," Yuval Rotem, director general of the Israeli Foreign Ministry and head of Israel's team, told reporters. Rotem also expressed concerns about a spike in anti-Semitism in Poland that has erupted amid the dispute with Israel, saying that would be addressed during the talks as well. Polish team leader Bartosz Cichocki, a deputy foreign minister, said his side was committed to fighting anti-Semitism and to "defend and promote truth, freedom of research, artistic performance and public debate." "We are here open and ready to answer all the questions and clarify whatever is left to be clarified with regard to the anti-defamation law," Cichocki said. Critics of the law argue it is so broad and vaguely worded that it could be abused. A prominent Jewish journalist, Konstanty Gebert, challenged prosecutors with an article Thursday in the Gazeta Wyborcza daily that he said "may constitute a crime" under the new law. Gebert wrote that "many members of the Polish nation bear co-responsibility for some Nazi crimes committed by the Third Reich," referring to the wartime massacres of Jews by their Polish neighbors in villages like Jedwabne. He also wrote that "the Polish state committed a crime against peace" when it took part in the Soviet invasion of Czechoslovakia in 1968, among other examples. The law has also been criticized by the United States, which fears it could stifle free expression and academic research. Officials have warned Poland it could hurt Poland's strategic relationships with both the U.S. and Israel. Recognizing the concern about the law, the government dispatched Undersecretary of State Marek Magierowski to Washington this week to meet officials, lawmakers and Jewish groups to try to allay their fears. Magierowski said Wednesday that Poland would never "whitewash" its history or the fact that some Poles did commit "ignoble acts" during World War II. But, he said the law gives the government a means to fight back when the country is accused of complicity in the Holocaust.